Here's Johnny! These words have become somewhat famous as a way of introducing yourself, and in this Here's Zombie! T-Shirt, the spirit and horror of this iconic phrase is kept alive, all while giving it a new, updated and totally zombified look. 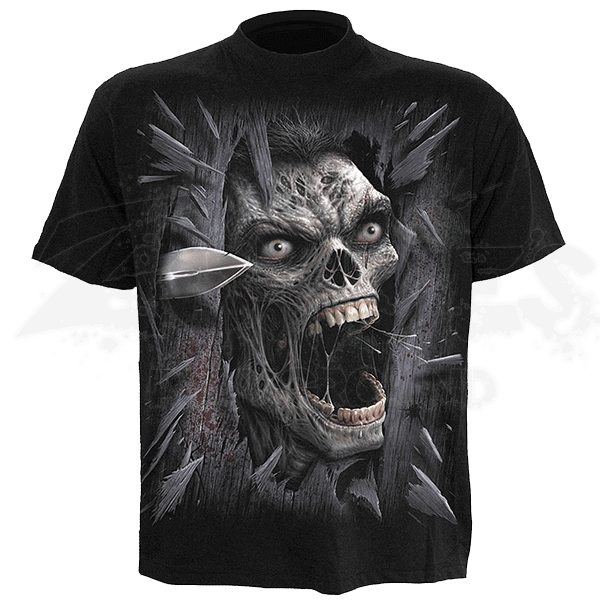 This shirt is very much almost a complete scene, depicting, on front and back, what happens when you try to lock a zombie out of your house using only a wooden door. It also resembles a certain eerie scene from a hotel horror, which only improves on its style. 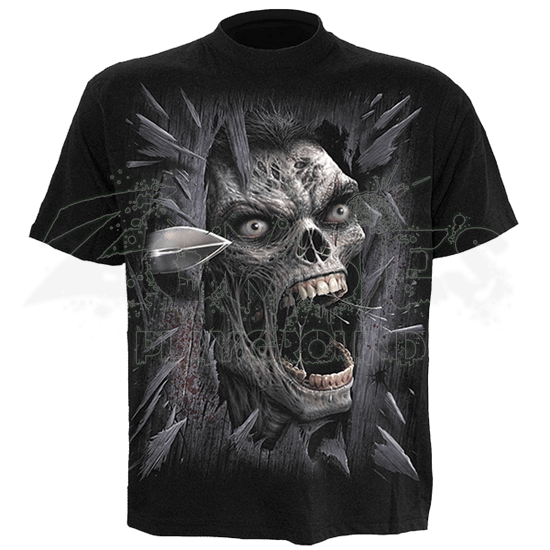 The front of the shirt features a wooden door, broken and splinted, with a zombies face emerging through the biggest gap, its maw opened wide in a hungry snarl. Splinters fall away from the door, jarred loose by impact, while the pointed edge of a weapon is impaled right next to the zombies head. The back of the shirt continues the scene, depicting the view of the victim as they look up at the zombie above, lit only by the glow of a single round light fixture. The designs are printed onto a black tee shirt using skin friendly dye, while the shirt itself is made entirely from 100 percent high quality cotton fabric. So not only does this Here's Zombie! T-Shirt feature a great deal of classic horror style, but it is also impressively comfortable, too, which makes it THE shirt for enthusiasts to wear on any given day of the week.